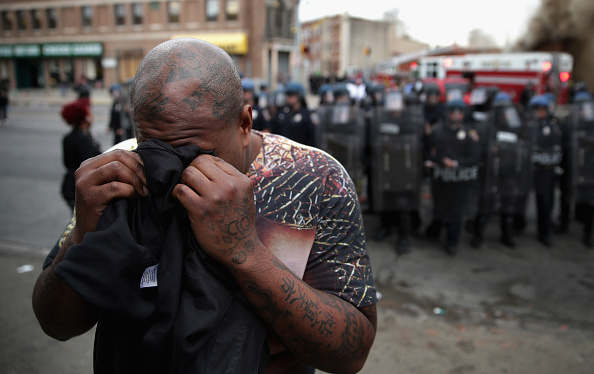 What more can we say about Baltimore and Freddie Gray? Tonight there is unrest in Baltimore after the funeral of Freddie Gray, a black man who suffered a spinal cord injury after an arrest by Baltimore police. Gray is now dead. We’ve been here before, haven’t we? As I look over what bloggers have written in the past four or five years as high-profile case after high-profile case of black men and boys shot or killed by police or neighborhood watchmen, I’m momentarily silenced. What else is there to say that hasn’t already been said? In 2013, 40+ years after desegregation and Martin Luther King Jr’s speech on Washington’s monument, we. are. still. slaves. We are free, yes, and slavery is illegal … an amendment in the Constitution says so. But systematically? In people’s minds? In our OWN minds as people of color? No … we are far from free. No we are not free, and since Obama started his run for office back in 2007, the hate for the color of our skin and our culture has been getting louder, bolder, and more vile than I can remember hearing and experiencing growing up. Yes. We ARE still hated, still thought of as less than human. Post-racial America? No, not really. Actually, that phrase makes my blood boil. It is a lie perpetuated by people who just want to make themselves feel better. We still live in a country wrought with bigotry, racism, and socioeconomic warfare. Instead of lying to ourselves, why don’t we try to make a difference? Trayvon Martin, Eric Garner, Tamir Rice, Michael Brown. Freddie Gray. There are more. The exercise isn’t in listing them; the exercise is in acknowledging that death is never the price for any crime in the United States without due process and that black men and boys are incarcerated at six times the rate of whites despite being a racial minority. When something like this happens, I am cautious about reacting initially, because my white skin is not in the game. I can react, sure, but it’s not the same, it cannot be the same, because my experience is the white privileged experience. Every time a black man or boy is killed by police, I find myself reaching out for a woman of color’s reaction because I want to hear their truth. But can’t we all guess, all of us, what it must feel like to see people who look like your husband or brother or daddy killed while saying, “I can’t breathe?” How many more ways can we structure the sentence, switch up the meter, try an action verb? The lede is the same: Please stop. This hurts. This is not how justice works. I am tired of trying to find reactions. This just needs to end. We as a nation need to acknowledge the past and the fact that there is a deep and dark history between whites and blacks in America that is perhaps even unique to just America. We (and I’m talking to you, ladies, who look like white, blond me) need to stop and check any reaction we have to black boys we see on the street. You see a black boy in a hoodie walking up to you on the sidewalk. Are you thinking of the nightly news? Or are you thinking of a human being with his own set of hopes and dreams? The news tries to make you fear all black boys. Why? Change happens slowly, and it begins with protests — physical and verbal. Something has begun in America. We’re seeing at least coverage of the deaths of black men and boys. Change will happen faster if all of us speak, all of us react. It’s true our experiences may not be the same, but let’s bear witness together to every incident. It’s hard to keep rising up with every trial, every news event, but we have to. And at some point, it will be your turn to write. Rita Arens is the author of the young adult novel The Obvious Game & the deputy editor of BlogHer.com. This article originally appeared on BlogHer.com.